Rock n’ roll music owes a major debt to Buddy Holly, a man whose unique styling influenced many of rock’s superstars, including the Beatles. As one of rock’s first superstars himself, tragically, he was also one the first great rock stars to pass away much too soon on Feb 3rd, 1959, in the plane crash that also claimed rock stars Ritchie Valens and J.P. “Big Bopper” Richardson. At the age of only 22, Buddy still left the world a vast treasure of his musical genius and talent. His many wonderful songs live on the countless covers by other stars of yesterday and today. . . In Tim’s one-man variety tribute show, "Rock n’ Roll Heroes," "Buddy Holly" is one of the five power-stars. 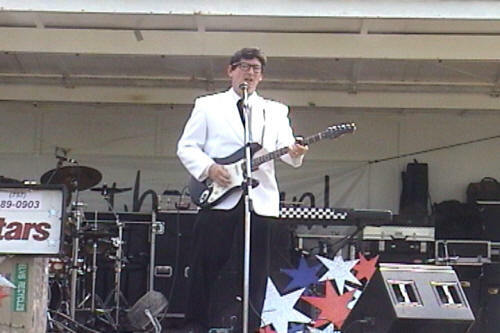 His "Buddy" is also a popular solo act nationally for any venue or 50’s event wanting the excitement of a "Buddy Holly" tribute concert performance. 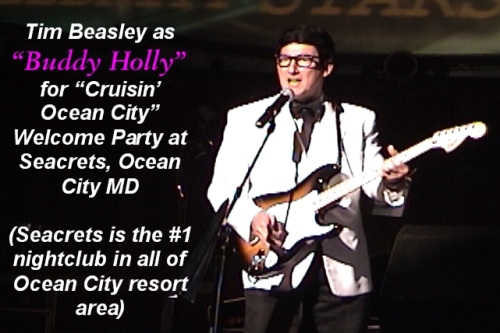 Take a "look and listen" at the web videos below of some live shows that include recent performances for the City of Virginia Beach, VA’s big July 4th celebration, also a very popular tourist destination, Abbey Road Pub, a "Beatles" themed restaurant, and the big welcome party for 3500 car club attendees at Seacrets (mega-nightclub) in Ocean City MD. Book Tim now as "Buddy Holly" for a 50’s musical Rock n’ Roll event that everyone will "Rave On" about!